Home > Clondalkin Drug and Alcohol Task Force strategic plan 2018 – 2025. Reclaiming community development as an effective response to drug harms, policy harms, poverty and inequality. Clondalkin Drug and Alcohol Task Force. 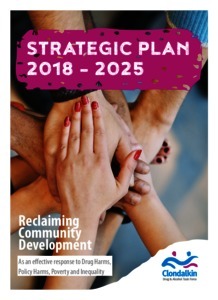 (2018) Clondalkin Drug and Alcohol Task Force strategic plan 2018 – 2025. Reclaiming community development as an effective response to drug harms, policy harms, poverty and inequality. Dublin: Clondalkin Drug and Alcohol Task Force. Cutbacks to services and incomes have contributed to what many described as a crisis for a significant number of families and communities. What most respondents saw as a breakdown in community infrastructure generally has contributed to the difficulties. Community-based drugs projects and services have seen an increase in demand for services while their funding base is shrinking. Projects and local services in this situation are fulfilling a very wide community development and family support brief while, at the same time, they are funded and required to report on a much narrower set of functions related to the delivery of drug and alcohol services. Difficulties are added to by ongoing criminal activity locally, frequently accompanied by intimidation and a fear for personal safety for those who become actively involved in responding to drug and alcohol misuse in the community. Finally, the intergenerational nature of drug and alcohol misuse had become clearer as the crisis for particular families and communities has deepened. While the challenges are substantive and significant, however despite this there is agreement that the CDATF need to take into account of and build upon these strengths in the current strategic plan and into the future.